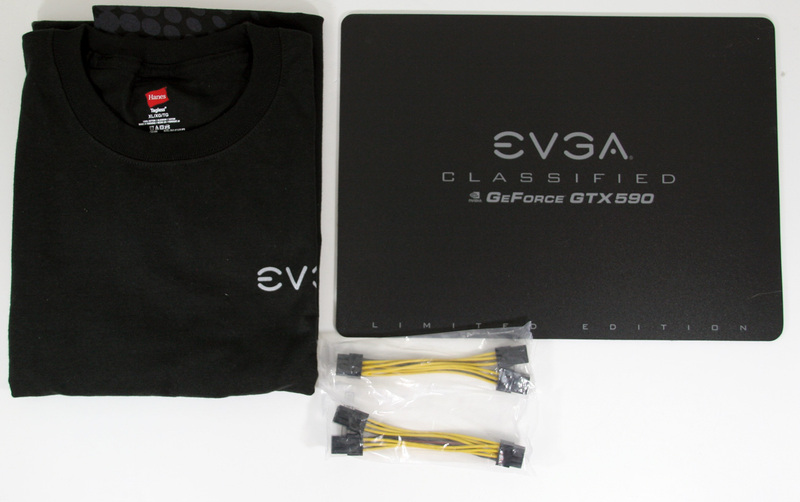 Meet The EVGA GeForce GTX 590 Classified, Cont. Now that we’ve had a chance to discuss the GTX 590 reference hardware, let’s touch on the rest of EVGA’s package. As we previously noted the EVGA GeForce GTX 590 Classified is being positioned as a premium product with a $30 price premium, so let’s see why. We’ll start with the box—the box EVGA is using is quite simply enormous. EVGA will be selling both single GTX 590s and pairs of GTX 590s using the same box, so the resulting box is big enough to carry two cards. Presumably this isn’t being sold in any retail stores, as a result the box is nearly blank save for the product name on the front. 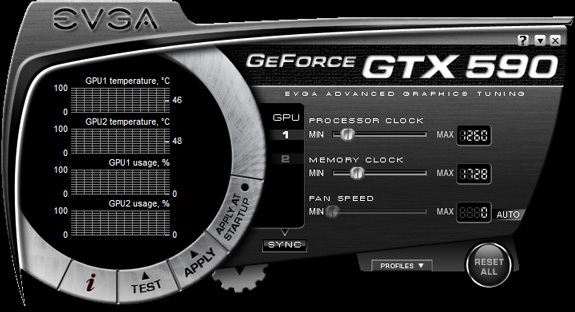 EVGA is offering up their usual suite of overclocking tools with the GTX 590, however only EVGA Precision is on the disc. EVGA OC Scanner and ELEET can be downloaded from EVGA’s website. Of the software tools we’ll start with ELEET, as this is the only tool we haven’t covered before. EVGA has had ELEET for some time now for their motherboard business, as it’s their principle motherboard overclocking tool. However at the end of last year they added GPU voltage control through the utility, finally allowing users to overvolt their GPUs using only EVGA tools. We’re glad to see EVGA went with a less-is-more approach with the design of the utility, ditching any funky skinning and focusing on usability. 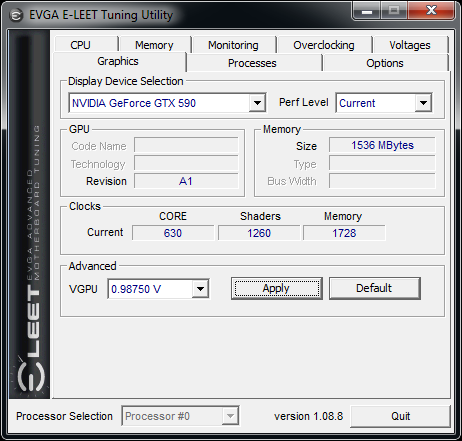 One thing ELEET does that we have not seen on any other utility is that EVGA allows for controlling the voltage for more than just 3D Game clocks; idle and low-performance voltages can also be controlled. We’re assuming the purpose here is to undervolt those modes rather than to overvolt them, as the latter is counterproductive. At this point ELEET’s only notable weaknesses are related to the fact EVGA implemented voltage control separately from EVGA Precision’s overclocking support. As a result you need to launch ELEET separate from Precision to set any voltages if your overclocked settings require overvolting, and at the moment ELEET does not have any kind of profile support, meaning you have to manually dial in the voltages on every boot. This isn’t utility breaking, but there’s a clear potential for annoyance. EVGA tells us they will be fixing this in the future. Update: April 2nd, 2011: Starting with the 267.91 drivers and release 270 drivers, NVIDIA has disabled overvolting on the GTX 590 entirely. So while everything we've written about ELEET remains, with the GTX 590 Classified it is effectively rendered obsolete. The next utility in EVGA’s suite is of course EVGA’s fantastic EVGA Precision overclocking tool. Based on the famous (and now discontinued) RivaTuner, Precision is a custom-skinned and up to date utility based on RivaTuner technology. It features per-GPU overclocking controls, an OSD overlay, and hardware monitoring/logging. Alongside MSI’s Afterburner, we believe it sets the gold standard for GPU overclocking/monitoring utilities. 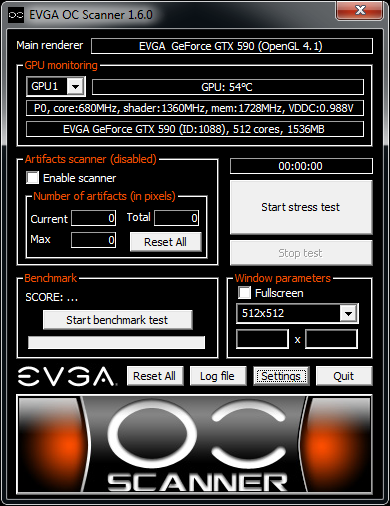 The final utility in EVGA’s suite is the EVGA Overclock Scanner. In a nutshell, the OC Scanner is a load-generating utility (ala Furmark) which rather than generating a moving image generates a static image. By generating a static image it’s possible for the software to identify any rendering errors in the image that would be indicative of a bad overclock. Or in other words, if you’ve overclocked your card too far, this utility will let you know. With the wider range of overclocking options afforded by ELEET, OC Scanner takes on an additional degree of importance for establishing both stability and safe operating temperatures, nicely rounding out EVGA’s software suite. All told the suite should cover 99.9% of most users’ overclocking needs. Wrapping things up, as is customary for their high-end cards, EVGA is offering a lifetime warranty for the GTX 590, so long as the card is registered within 30 days. Notably overclocking does not void the lifetime warranty (this turned out to cause quite a bit of commotion with the 6990). 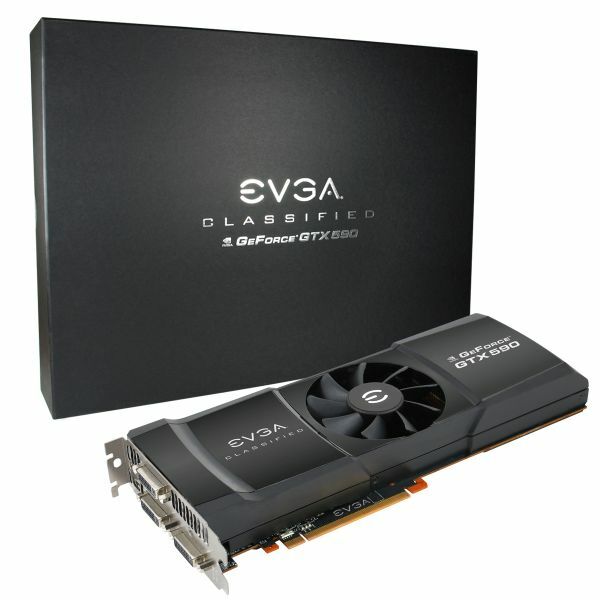 Altogether, the entire EVGA GeForce GTX 590 Classified package has an MSRP of $729.